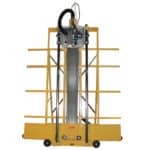 The Varsity Series Vertical Panel Saws are for customers that need the cutting capability and precision of a full size panel saw but are limited by space, need portability, or have limited budgets. 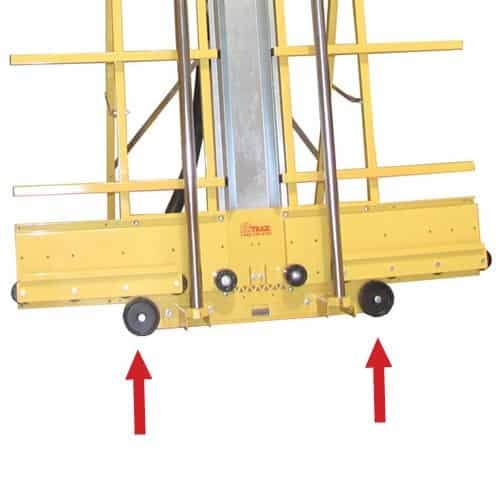 Because of the easy-to-use folding stand and frame wheels, this machine is very easy to move. 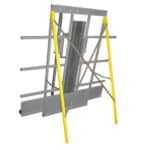 It is ideal for job site use or in cramped spaces. 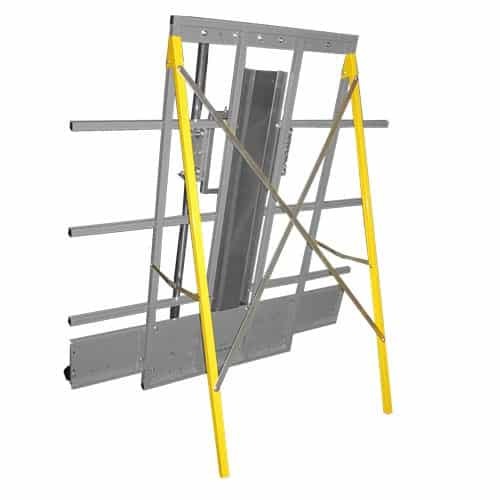 When needing a vertical panel saw to precision cut sheets up to 1¾ inches thick and space, portability, or budgets are an important issue, the Compact frame is the perfect answer. 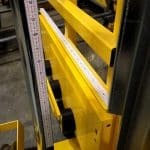 Everyone has seen how fast and easy the vertical panel saws are to use in the Home Center stores. Imagine having a portable version of that but more accurate and with more capability? As my old Drill Instructor would tell us, “If a man can conceive it, a man will achieve it”. 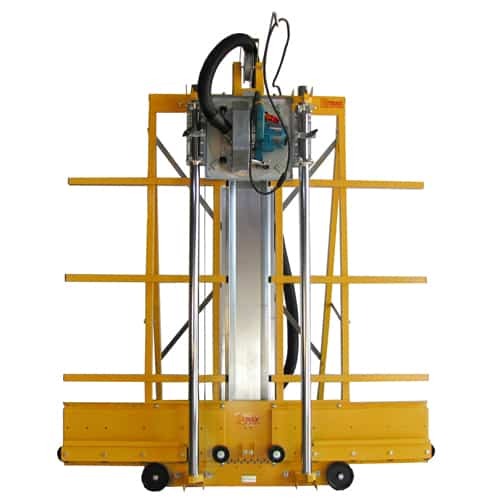 The Varsity Series Vertical Panel Saw gives you the capabilities of much larger machines, in a smaller portable package. 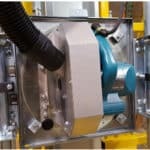 The smaller package means lower cost but has more capability than the Home Center machines because of the Unique quick change carriage that allows other tools like a router, pivoting razor knife, glass cutter and rolling shear. So you say, “What makes this better than a Home Center vertical panel saw?” First, this machine uses real steel bearings and not U bolts with plastics rings, giving it a smoother and more accurate pull stroke. 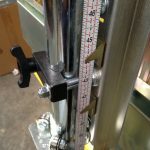 Unlike Home Center machines that have 13 adjusting points for squareness, this machine is always square because of the single factory set-and-forget Accu-Square alignment system. The Makita 5007F off the shelf 15 amp. saw uses easy to find 7.25 inch saw blades. Other machines use obscure and expensive 8″ blades and proprietary saws causing long down times and expensive replacements. The dust collection uses a Dust Brush to surround the blade so that the saw dust is actually contained until the larger 2.5″ vacuum hose evacuates it. Other machines use a thinner hose and a vinyl tube that has to be adjusted for each thickness of material cut. It is usually cut into and discarded the first week of use. Besides sawing, the quick change carriage allows fast cutting tool changes such as a floating router, pivoting razor knife, aluminum composite rolling shear and glass cutter. 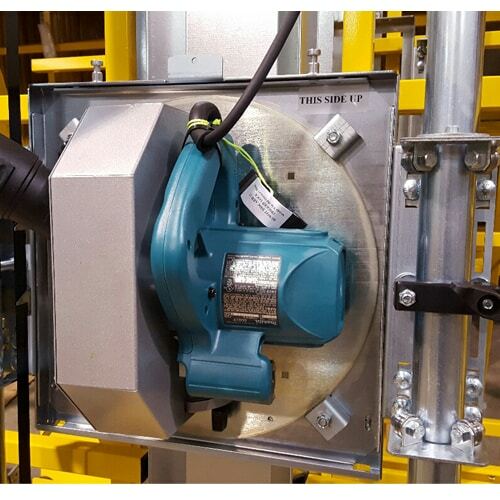 Inconspicuous features make this machine much easier to use than other panel saws. A lighted viewing port in the dust bonnet of the saw make it easy to align your saw blade with a mark on your material. 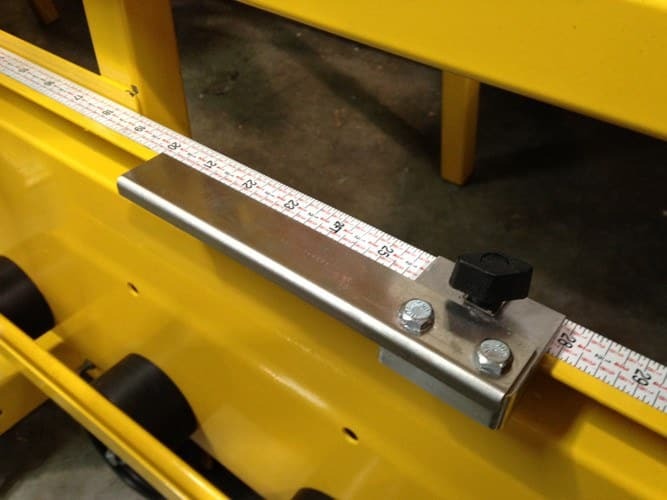 We incorporate a center step that prevents small pieces from falling and bouncing back into the saw blade after a cut. Other machines take two people to fold their stand, ours is an easy one man folding stand that folds like a ladder. 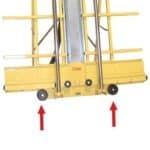 For stability, our frame wheels are only on the ground when the machine is in use. 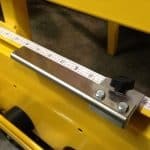 For faster cut set ups, we incorporate two rip gauges that allow cutting from either direction and a stop that can be used on either side of the machine (and optional mid fence) that incorporates a bar for cutting strips. Basically, the Varsity is a smaller version of the 1000 series vertical panel saw giving you a less expensive and more portable version of a full size panel saw. 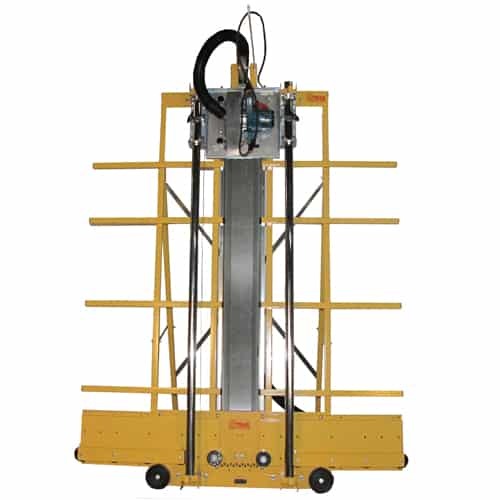 It is ideal for customers that need a vertical panel saw to precision cut sheet goods that are up to 1 ¾ inches thick.